General educational curriculum of Nepal, especially in government schools, emphasizes only on teaching facts and theories bounded in limited core subjects, required for a student to pass the national level, paper based examination. This does not ensure holistic development of the children but judge them on the basis of their memorizing and retaining capacity. On 26th and 27th of July, NJSI hosted a training for trainers on Integrated Pedagogical Paradigm (IPP) whose objective was to train the teachers to aware their colleagues to adopt the teaching method that focuses on overall development of the students. 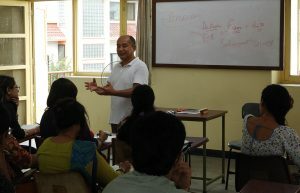 The training was facilitated by the regional superior of Nepal Jesuit Society, Fr. Amrit Rai and attended by 15 teachers and staff from 4 schools, Navjyoti Center and NJSI office. The training was concentrated around the notion that “Education is change of experience”. The participants were trained to motivate the students by understanding their individual contexts and experiences, teaching them to reflect, leading their action, and evaluating the transformation. They were made aware about 8 intelligence according to Multiple Intelligence Theory of Howard Gardner (Logical, Linguistic, Spatial, Intra-personal, Interpersonal, Kinesthetic, Rhythmic and Naturalistic). Students may be good in few and not in others. It is important for the teachers to let students grow in their intelligence. 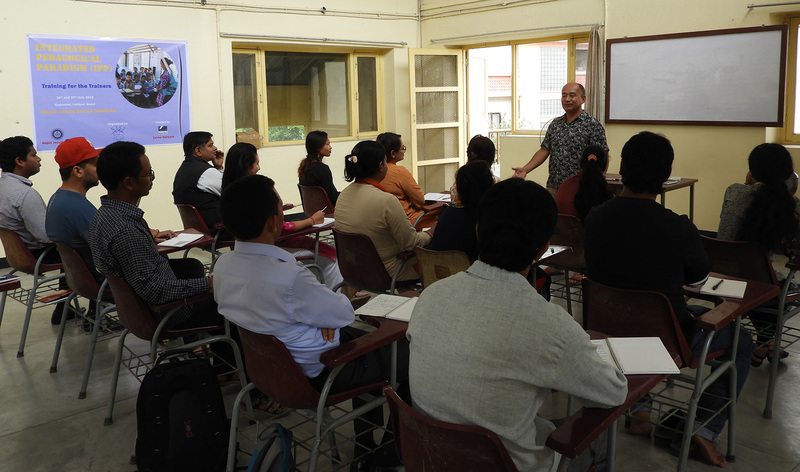 One of the teacher, Mr. Dinesh K.C said, “I had learnt many theories to improve the learning of the students but through this training, I have received practical techniques of applying them in the classroom. We learnt how to create such environment where students can flourish from all angles. This way we can have behavioral transformation rather than having only knowledge based transformation”. 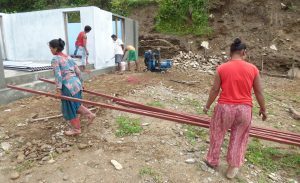 A beautiful multipurpose hall has been constructed and handed over to the Jal Devi Women’s Group of Suri, Dolakha on 19th July 2018. It consists of a cozy office room, a big hall and a conventional washroom with a wide open space outside the building. This hall has been a symbol of unity and generosity. 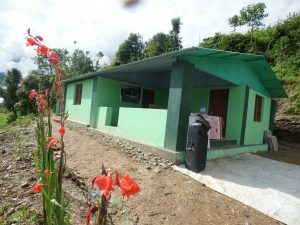 Not just the members of the women’s group, but the entire community worked wholeheartedly since the beginning of the construction. Men, women, mothers, elderly ones, youngsters, everybody happily contributed on the construction. The construction team also worked effectively despite harsh monsoon and difficulty in transportation of the materials. The land was also a donation from two kind families. The NJSI team was touched by the humility of the people. NJSI will be conducting various awareness programs and skill enhancement training at the hall. The hall will also be used to organize community events. NJSI is thankful to all individual supporters and Xavier Network for their contribution in establishing an emblem of compassion. 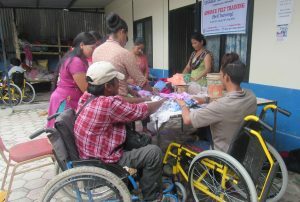 NJSI funded a skill training program, “Advanced Felt Training Program” to the members of Disabled Service Center located at norther corner of Kathmandu, Tarkeswor. Disable Service center is a shelter home for differently-abled people . Altogether 22 differently-abled people from 16 yrs to 61 yrs age group reside in the center. The center has been working to empower differently-abled people through vocational and skill training programs. 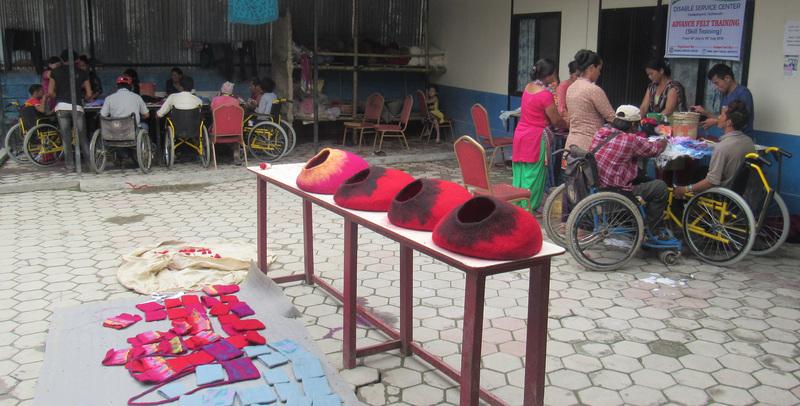 The chairperson, Chandra Bahadur Khatri who is a wheelchair person himself, says they initially learnt to make handicrafts of felt material from YouTube; however as the product finishing was not good, they had to hire a trainer for which they did not have sufficient fund. NJSI funded the training program that started from 10th of July to 16th of July. 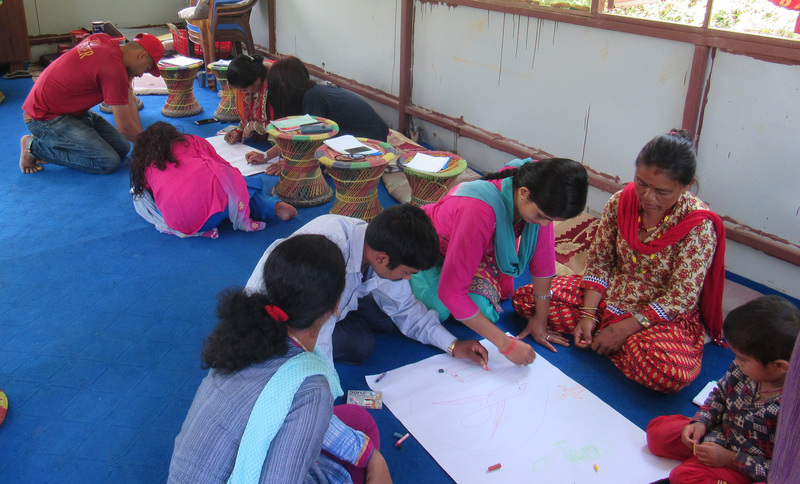 Jamuna Thapa Magar trained 20 participants among which 13 were differently-abled and 7 were under privileged women. They prepared materials like bags, carpets, earrings, decorative items, caps etc. The participants were happy to receive completion certificate on 16th July. The chairperson expressed his gratitude towards NJSI and said that they can now prepare other advanced felt items with the perfect finishing touch. 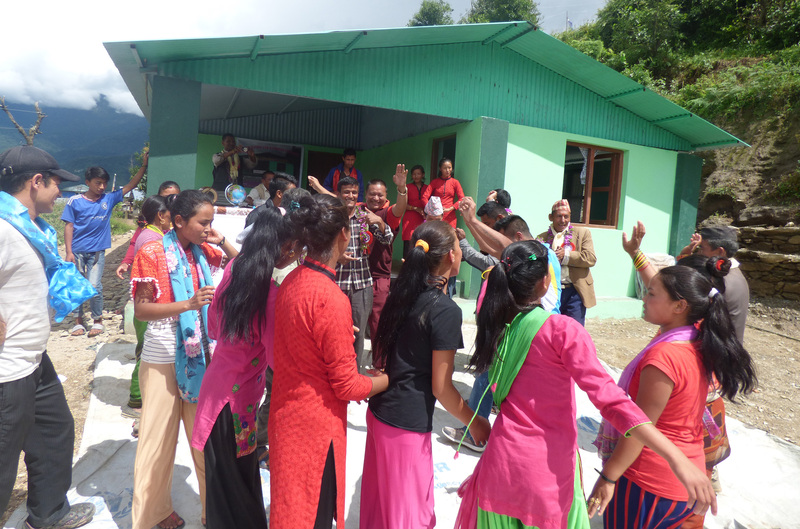 After the successful completion of the basic tailoring training last year in Jaretar Kavre, the recipients had requested NJSI for an advance one. Now, they feel proud to have completed the advance one as well. On 15th of July, they were awarded with course completion certificate. This training focused on making clothes like gown, blouse, kurtha suruwal, topi, daura suruwal etc. 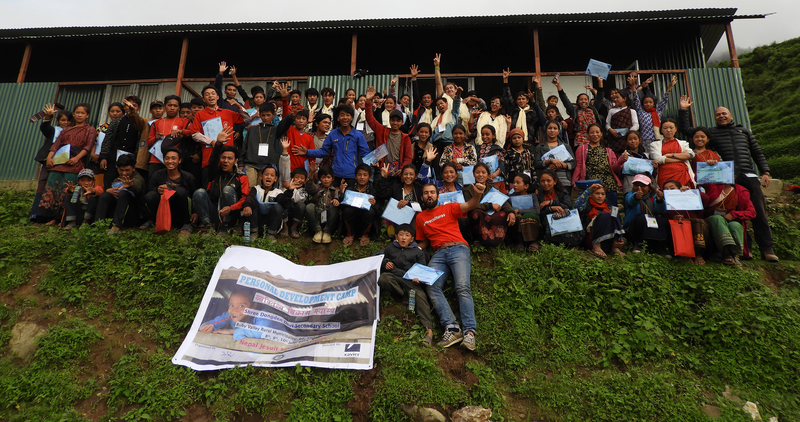 Among all the recipients, 11 were from Danuwar community and one was from Tamang. Most of them came from poor family background. They were happy to have skill which will eventually help enhance their economic status. Impressed with the work of these ladies, the trainer, Babita Danuwar says that she will help them in finding job. NJSI conducts regular training program for caretakers and teachers of children with special needs. 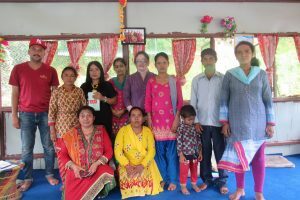 On 6th and 7th of July, another training on Applied Behavior Analysis Therapy was given to 8 caretakers of Kalidevi and Bhagwati hostels by a senior psychologist Rama Karki, who is affiliated with SOS. The trainees were exposed to adaptive methods of counselling the children in distress, and controlling their frantic behaviors. Some of the method included storytelling, engaging in fun activities and games, and techniques like “time out”. The participants confess that time, patience and love for the children have been the major factors, helping them understand the children and minimize their agitated behavior. After the training they share that they learnt better ways to engage with these special children. Monsoon is the time for cultivating millet, clear off weeds and harvest potatoes in Tipling, the remotest village of Dhading. At this time of the year, schools have monsoon holidays when some of the students help out their parents in farming activities, take care of cattle and some of them go down to the near by cities to get additional tuition for Secondary Education Examination preparation as well. This monsoon holidays between 8th to 10th of July, NJSI conducted “Personal Development Camp” in Tipling helping them to experience a different kind of monsoon holidays. The camp focused on motivating the students to be mindful of self, community and environment through exposure to higher education, scholarship prospects, entrepreneurship, career options, Eco club and critical thinking. The total number of 68 students of Dongden Devi Secondary School from grades 6 to 10 participated enthusiastically in the camp. The NJSI team was impressed with the willingness of the students to learn, and participate in meaningful purpose. Angela Maya Tamang of grade 9 writes in her post evaluation, “I learnt that we should think critically whether the given information is right or wrong before believing in them”. An Eco club was established with a promise to protect the environment and work for healthy community. A cleaning campaign was conducted as the first project of the club. 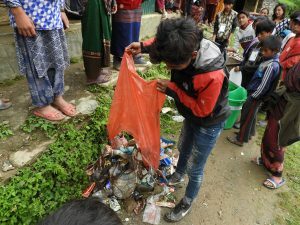 Later, most of the students responded that they will not throw plastics waste haphazardly anymore; instead they will pick them up if seen around. Fr. 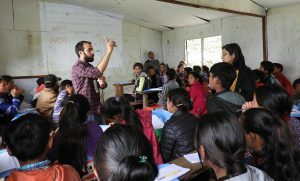 Tek Raj Paudel SJ, who has been teaching at Dongden Devi School for 3 years, acknowledges that it was the first time students participated in such events. He felt proud to see his students accepting participation identity cards and certificates with dignity. NJSI is thankful to Xavier Network for their support in this meaningful project.